Posted 5/29/2018 4:02pm by Martha O. Wilczynski. Summer hours: (June-August) Monday - Saturday 10 am to 4 pm. We are offering drop-in wreath-making classes the 1st 3 weeks of June on Mondays and Fridays from 2 pm to 4 pm. You should allow at least an hour to make a wreath, so please come by 3 pm if you want to participate. 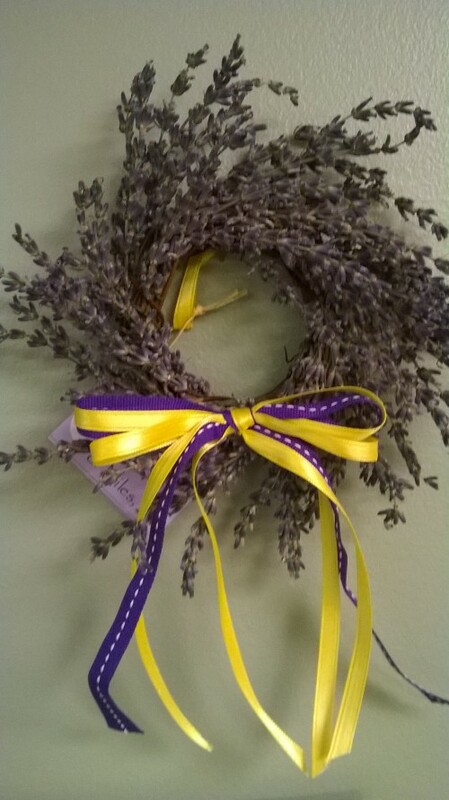 The cost will be $18 each and include all materials (dried lavender, wreath base and ribbon and wire) and personal instruction. We will hold the classes outside if the weather is nice. If it looks like rain, please call ahead, as limited space for classes is available in our shop. This is our 8th season of U-pick lavender! If you are new to this, it is a spectacular lavender flower show. It begins with our English Lavender varieties in bloom, followed in July by three varieties of hybrid lavender that bloom in sequence (with some overlap) from early to late July. During this time, for the price of $5 per bunch you are able to wander through the field and cut your own bunch of lavender from the varieties ready at the time. We provide scissors to cut the stems and a twist-tie to fasten and measure the bunch. We also have chairs in the shade of an oak and hickory tree where you may sit, relax and enjoy the fragrance and scenery. Our gift shop is the perfect place to find all the fragrant, useful and decorative lavender items you need for gifting and self care. A frequently asked question is "when is the most lavender in bloom?" The answer is, there are two peaks of bloom. Our English lavender bloom is usually at its peak the last week of June. These varieties are the best for culinary (cooking & baking) use as well as for aromatherapy and decorative use. English lavenders have shorter flower stems and sweeter scent than the hybrid lavender varieties that bloom in July. Our second peak is in mid-July (roughly the 9th to 15th) when we have some overlap between the three varieties of hybrid lavender we grow: 'Grosso' which usually starts blooming just after 4th of July, 'Super' which starts around the 10th of July, and 'Gros Bleu' which generally starts blooming around the 15th of July. Note: these dates may vary somewhat based on the weather conditions in any given year. Hybrid lavenders have long stems and strong, but pleasant scent. They are great for spectacular fresh or dried fragrant bouquets, potpourri, lavender sachets and decorative use. Hope to see you here this summer!